Let me begin by stating that grizzly bear attacks are rare. Just because you’re hiking in grizzly bear habitat, which Montana’s Glacier National park is, does not mean you’ll even encounter a bear. However, if you do come across a grizzly bear while hiking in Glacier National Park (which is one of the most exhilarating and frightening experiences you might ever have), how you react will either deter or encourage a grizzly bear attack. You’re enjoying a day hike on one of Glacier National Park’s many trails. Suddenly, about 20 yards away you spot a Grizzly Bear. Now, what do you do? It’s more what you don’t do upon encountering a grizzly bear and that is DO NOT RUN AWAY. Sure, this is your first instinct; it’s natural fight or flight taking over. But your hiking safety depends upon restricting this urge. Why? 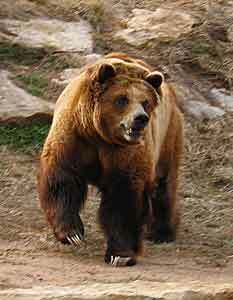 A running grizzly bear can reach nearly 40 MPH. Even without a pack weighing you down, unless you’re an Olympic caliber athlete, the fastest you can run is around 10 MPH. Furthermore, by running you’ll trigger their chase/attack instinct and this is the last thing you want. Next, immediately break eye contact – staring a bear in the eyes is a sign of aggression. Good. You’ve kept your ground, haven’t succumbed to your flight instinct, and have broken eye contact. Now, slowly raise your hands to your chest, palms outward, and talk in a calm, monotonous, soothing voice while tiptoeing away. Phew! 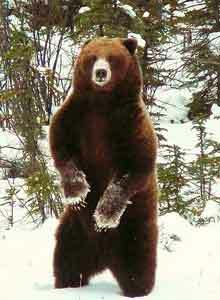 The bear’s non-aggressive and just ensuring you’re not a threat. But what if it’s chomping on its jaws, has its ears peeled back and is glaring at you? These are signs of an aggressive bear. STAND YOUR GROUND! I know this sounds counter-intuitive. But most grizzly bear charges are bluffs that don’t result in an actual grizzly bear attack. They’re not hunting you, just ensuring you’re not a threat. The majority of charges will stop feet away from you. COLLAPSE TO THE EARTH. Lay on your belly. Cover your head with your arms and hands. Your pack will protect your back. Unlike common thought, the grizzly bear isn’t just going to sniff you. It won’t be a full on grizzly bear attack like he’s hunting you for food, but the bear will claw and/or bite you. Don’t scream, don’t flail, lie perfectly still and wait for the bear attack to end. Soon enough, the grizzly bear will leave you and continue on its way once it realizes you’re not a threat. Terrifying? Yes. A proven, successful strategy? Indeed. Why Do Grizzly Bears Attack? 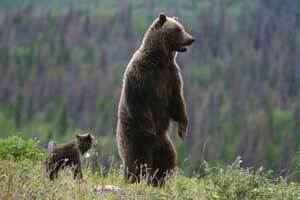 Most bear attacks occur from a mother protecting its cub or a young bear protecting its turf. the chances of an aggressive attack increases exponentially. Still take all this information to heart, but the charge probably won’t be a bluff. So, in case of a charge and you’re without bear spray, I’d suggest immediately falling to the ground and covering up. Have you seen a grizzly bear while hiking? People need to know that hiking through grizzly bear habitat is not dangerous. Share your bear spotting story! Glacier National Park Gun Laws: Think a handgun will protect you against a grizzly bear? Think again. Bear Repellent: Only bear repellent successfully deters an aggressive grizzly bear 90% of the time. Learn why and find cheap bear spray to protect your family. Grizzly Bear Knife: Is there such thing as a grizzly bear knife, which can successfully save your life? Like the Glacier National Park Travel Guide? So much more is added weekly! Stay up-to-date on travel advice for planning your Montana vacation by signing up for the Growing Glacier Newsletter! Published only twice a month, it will be sure never to clutter your inbox. Living in Colorado, I have bear encounters many times each summer. (I walk dogs in the National Forests and have bear visitors in my yard, etc.). However, these are Black bears and are great at letting you know they are there … one just has to walk away. I understand Grizzlies are more dangerous and I will definitely bring bear spray with me when I visit this Fall. Thanks for all the information!